£9.99 (2 CDs) - 30% off - Limited time only! Gilbert Kaplan was one of the most authoritative and acclaimed interpreters of Mahler’s Symphony No. 2, having conducted the work at the invitation of more than 65 orchestras. His 1987 recording with the London Symphony Orchestra is the best-selling Mahler recording in history, with sales approaching 200,000 copies. It was named one of The New York Times’ “Records of the Year.” A second recording, with the Vienna Philharmonic, based on the New Critical Edition of the score for which Kaplan served as co-editor, was released in 2003 on DG. 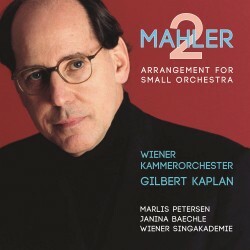 With sales of almost 50,000 copies, it is the best-selling recording of Mahler’s Second since the date of its release. This, his third recording, based on a live performance at the Konzerthaus in Vienna, made history once again – not only capturing the imagination of his vast worldwide followers, but also providing an opportunity for chamber, community and regional opera orchestras to perform this work which normally requires more than 100 musicians (there are only 56 musicians performing on this recording). His recording with the Vienna Chamber Symphony sets the benchmark. While reducing the instrumentation, Kaplan and his co-arranger Rob Mathes remain faithful to Mahler’s musical intentions and orchestral colours. They take a page, of sorts, out of Mahler’s book – the composer made numerous arrangements himself, often adding (rather than subtracting) instruments to symphonic staples by Mozart, Beethoven, Schubert and Schumann. In another nod to history, the Kaplan/Mathes chamber arrangement recalls Schoenberg’s scaled down versions of Mahler’s Das Lied von der Erde and Symphony No. 4.